After Wilmington suffered a rainy fall and a chilly winter, we have finally reached spring. The first official day of spring was March 20th, 2019 and we “sprung forward” on March 10th, which means more daytime! Even though we technically lost an hour of sleep, we have more daylight to do much more than we could during the end of Daylight Savings Time. Since we have more opportunities to tackle responsibilities during the daytime, one chore that may seem daunting to some, but rewarding to others is spring cleaning. Spring cleaning is the act of decluttering places that you use the most often; whether it be your house, car, office, or any other areas that need some tidying up. Tidying up doesn’t mean just cleaning your dirty bathroom or your smelly car. It could also be the act of putting away those heavy coats and other winter clothes and replacing those clothes with your spring wear! People who usually start spring cleaning, give up because there are too many areas to tackle or realize that there is always next year. However, one woman has made an impact on several lives that not only have organizational issues but can share with the world that tidying up may not be so daunting after all, Marie Kondo. If you binged watch any Netflix series, then you’ve possibly come across the popular Netflix series, “Tidying Up with Marie Kondo.” In the hit series, Kondo is invited to step into the lives of people who suffer from organizational issues or have a difficult letting items go that give them “joy” even though the items may be a doorstop. Kondo explains her method to her clients and reassures to them that it’s more than just throwing out the things you no longer need; it’s about choosing joy. Rule #1: Commit yourself to tidying up. Rule #2: Image your ideal lifestyle. Rule #3: Finish discarding first. Rule #4: Tidy by category, not by location. Rule #5: Follow the right order. Rule #6: Ask yourself if it sparks joy. If the item doesn’t “spark joy,” to the client, Kondo asks them to thank them for the joy that they did give them, and then let it go the item that they wish to discard. Although the KonMari Method can’t organize certain aspects of your life, it can undoubtedly tackle those areas of your home that you’ve been procrastinating for the past year or so. Get started on your spring cleaning, Kondo style. And the Oscar Goes To…Advertising! The Academy Awards were last Sunday, and I think it’s safe to say there were plenty of surprises throughout the night. From the program having no host, to Green Book unexpectedly winning Best Picture, there was plenty to talk over the course of the next few days. Although director Spike Lee supposedly storming out after the Best Picture reveal, and Lady Gaga and Bradley Cooper’s steamy duet made headlines, things that didn’t get as much recognition were the various advertisement campaigns geared specifically towards the Academy Awards audience. It’s no secret that we are living in an age of recorded television and streaming services, and people have become impatient in general when it comes to sitting through commercials. Much like the Super Bowl, an awards show such as the Oscars are another example of a live televised event people tune in to in real time, and thus present the perfect opportunity to capitalize on viewers’ attention. While the adverts for the program didn’t cost nearly as much as those for the Super Bowl (according to Variety, 30 second advertisement spots for the Oscars cost between $2-3 million), it was very clear through the commercials’ content that they were advertising directly to the Academy Award audience, especially females. One example of this was with Walmart’s ad campaign. It’s known that fashion and style contribute to some of the Oscar’s biggest moments—both on the red carpet and in the award categories. Walmart, one of the night’s sponsors, seized this night of culture and fashion as an opportunity to advertise their clothing lines, while simultaneously highlighting film crew members and stylists who work endlessly behind the camera to make “movie magic” happen. The various commercials reinforced the idea that if ordinary people such as Julia Roberts’, Rami Malek’s, and Chadwick Boseman’s stylists can be glamorous and creative while wearing Walmart, then you can too! Another advertisement specifically aimed at women between the awards was a Budweiser commercial featuring Charlize Theron. In the commercial, Theron challenges female stereotypes while drinking her beer in a bar by challenging men to various games (billiards, darts, arm wrestling, etc.). An A-List celebrity, and a beautiful woman at that, was sure to capture and keep the attention of a time-shift-conditioned audience. Another Academy-specific ad campaign came from Google. The company utilized clips from various iconic movies, such as 2001: A Space Odyssey, Lady Bird, The Hangover Scream, Jerry Maguire, Deadpool etc., and depicted how the scenarios could have played out differently had Google been present in each scene. The commercials assume that viewers of the Oscars are movie buffs, and know enough about the films to understand the references within the commercials. What do you think? Do you believe the advertising efforts between the awards successfully kept audiences engaged? Did celebrities or those closely associated with celebrities influence your opinion about a product or brand featured? Comment below with your thoughts! 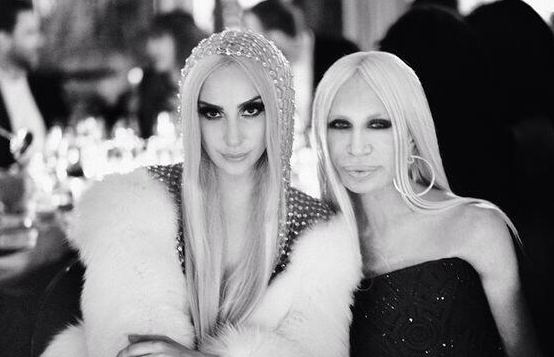 Ever wonder what could happen if two fashion superstars like Donatella Versace and Lady Gaga got together? They would open up a whole new world of consumers to both of their brands. Versace is a well-known luxury clothing brand that been around since 1978. The head lady in charge now is none other than Donatella Versace herself. Although Donatella is distinguished as a talented designer, it’s her vibrant persona that makes her even more famous. In recent years Versace usually went with non-famous models in their ad to focus more on the clothing instead of a celebrity name on it. This spring fashion season Versace is trying a new campaign with Lady Gaga as the focus. This change up in the ad routine of Versace is very positive considering the social power these women have. In leading up to this announcement, the two have been seen together everywhere. This new well established friendship is great for the Versace brand. Lady Gaga is a very influential woman not only in music, but in fashion. When someone thinks of Gaga, their first thought is “I wonder what she’s wearing this time?” She has a major advantage because of her power to expose this brand as much as possible. Versace is thought of more as a mature brand, but with Lady G’s influence over a younger generation this can reel in a completely different group of purchasers then before. Lady Gaga is quite possibly a twenty-four hour ad campaign for the Versace clothing brand. She is constantly being photographed in this brand that is then exposed all over the internet and in magazines. She truly has embraced the product, she is being paid to promote to exact detail including her new Donatella look. Not only do these ladies have reach on tabloids, but their social media sites are a huge way to endorse the company as well. The combined followers on twitter for Versace and Gaga is over forty-two million people. The two are always promoting one another on various media sites, creating this whole new revolution for Versace. Including a personalized hash-tag for the Versace endorser herself, #VersaceLovesGaga. This has been trending all over twitter, just proving how much influence she has also in the cyber world. This seems to be an extremely beneficial partnership for both brands and we’ll continue to see growth in Versace and Lady Gaga this fashion season. Marc’s Makeover: Marc Jacobs’ decision to rebrand… is it the right one? Deciding whether or not to rebrand your company is an immense decision. Your brand is the face and personality of your company. It is what viewers connect with. Changing this identity will greatly affect your company, but if done right the market can soar. Fashion designer Marc Jacobs has decided it is time for his company, Marc Jacobs International to rebrand. In an interview with David Amsden from W Magazine Jacobs explains the troubles the Marc Jacobs brand had encountered. Describing the brand as having been “diluted” from his lack of creative supervision and merchandisers pushing his design team. In order to fix this Jacobs decided to leave his position at Louis Vuitton to grow his company, which includes boutiques, clothing lines such as Marc by Marc Jacobs and Little Marc Jacobs (a children’s clothing line), Bookmarc (a bookstore), and more. Some changes have already taken place such as his decision to move his offices from Manhattan to London and his decision to part with longtime campaign photographer Juergen Teller after he creatively disagreed on the Spring 2014 ad campaign which features Miley Cyrus. So what is Jacobs looking to do? He’s looking to redesign the logo and packaging, to build his shoe and handbag lines, and maybe even change the name, which he told W Magazine that he had always hated. Rebranding can be daunting between redefining research, audiences, creative campaigns, and even products, but for those experiencing continuous losses, it is often the best way to launch back into the market. In recent years, another clothing line, Burberry, underwent a widely recognized successful rebranding campaign. Over the years, the British line went from being known for its historically iconic outwear, to being associated with cheapest form of high fashion, and even gang wear. In 2006, the company hired Angela Ahrendts and in the next six years, she turned the ubiquitous brand back to luxurious. First, Ahrendts did what she called “buying back the company.” Reigning in the 23 licenses Burberry had around the world, control was brought back to the company with centralized executive and creative offices that could maintain product authenticity and exclusivity. Secondly, Ahrendts recognized we are in the age of digital consumption and a digital generation – tapping into the resources social media and technology offers. In stores, sale assistants are equipped with iPads, and mirrors transform into screens displaying catwalk images. Online, the company continues to grow its presence, attracting over 16 million fans on Facebook, and over 2 million followers on Twitter. Burberry also uses YouTube to broadcast campaigns, events, music, and even corporate news. However, rebranding is not exclusive to high profile companies, the challenges above are things that can be experienced in all types of companies: personal, mid, or large. So how do you know if you should rebrand your own company? From Katie Morrell’s article “10 Signs You Should/Should not Rebrand” here are some warming signs that your company should rebrand. Maria Ross, author of Branding Basics for Small Business: How to Create an Irresistible Brand on Any Budget (2010, Norlights Press) suggests that if a company notices that their target customers are choosing the competition over their own company and if a decrease in sales is also trending, rebranding should be considered. Another element that should be considered when having a decrease in customers is “From a cosmetic point of view, when you look old and your looks don’t reflect what you are or what you deliver, it may be time to rebrand,” said Susan Betts, senior strategy director for New York-based FutureBrand North America. Rebranding is beneficial when a company wants to change their target customers. It gives a company an opportunity to create a new brand identity that the new target audience has the chance to connect too. When a company changes management, it is normal that policies and values change as well. When a companies values change, rebranding is a good idea. When a company changes it’s direction, rebranding can showcase to customers what they may or may not be aware of concerning this change. Betts also mentions rebranding should be considered when a company has a “New philosophy or a changed philosophy”. These signs are great examples to take heed from, but it is important to note rebranding should not be done unless it has been proven your brand identity is the root of your problems. Branding is the largest initial investment for a company, it sets the spring board for your identity, association, and customers. Rebranding is an even bigger investment – an attempt to reintroduce ideas to already established and preconceived perceptions is no easy task, it is one that must be thoroughly strategized. For Burberry, reigning in and refining their identity proved to be the best decision the company has made. For Jacobs, we will see what his creative vision produces. What companies do you think have faltered recently or over the years? Who needs to rebrand?